Savings bonds are often viewed as old fashioned in today’s society, and are really only seen as a gift you might give to a new baby or a grandchild. Savings bonds are however considered one of the safest investments in the world, as they are fully backed by the credit of the U.S. government. A savings bond is simply a debt security issued by the U.S. Treasury to help pay for government needs. There are two types of U.S. Savings bonds, which are series EE and I bonds. EE savings bonds are a low risk savings product that are often used toward education costs, retirement savings, and gifts for special events. Series EE bonds earn a fixed rate of return for the entire life of the bond, and interest is compounded monthly starting on the first day of the month in which they are purchased. The interest is added onto the value of the bond, so you automatically get the benefit of compounding. EE Bonds are sold at face value, i.e. you pay $100 for a $100 bond. At redemption, you will receive the face value of the bond plus the accrued interest. If you redeem a bond within the first five years of purchase, you will forfeit the interest payments from the previous three months. After 5 years has passed you are not penalized for resumptions. For current rates on Series EE Bonds go here. I Bonds are a low risk savings product. What makes them different from EE Bonds is the rate of interest they earn. The I Bond interest rate is made up of two components, a fixed and variable rate, which is set to reflect current inflation rates. The fixed component of interest stays the same for the life of the bond. The inflation component however is reset every 6 months. For example, an I Bond could have a 1.00% fixed component and a 2.6% inflation component. In this case, the interest rate would be an annualized rate of 3.6%, until the inflation component is reset. Although it does not happen often, if there is negative inflation (referred to as deflation) the inflation component in that period would be negative. This would mean that the combined rate would be below the 1% fixed component. No matter how much deflation there is however the combined interest is not allowed to go below zero. For current rates on I Series Savings Bonds go here. I Bonds are also offered at face value and have the same early withdrawal penalties as EE Bonds. Also called Current Interest Bonds, a holder of these bonds earns interest payments every six months from the date of issue. They do not increase in value and are worth exactly what you paid for them at the time of maturity. HH Bonds were discontinued in 2004 however are included here for comparison purposes. HH Bonds have a maturity date of 20 years and can still be converted to EE Bonds. Which is Better, Series EE Bonds or I Bonds? No wrong answer here, however I bonds typically outperform EE bonds. The only downside of I Bonds is that they could earn very little interest during times of a weak economy and deflation. In fact, during the recent recession the variable rate actually wiped out the fixed rate for a period of time, causing I Bonds to yield 0% for a while. The following table shows the pros and cons of each type of bond. Denominations To the penny, $25 or more. To the penny, $25 or more. Earnings A fixed interest rate and a variable rate combined. Fixed rate of interest. Early Redemption Penalties 3-month interest penalty if redeemed during the first 5 years. 3-month interest penalty if redeemed during the first 5 years. Regardless of which type of savings bond you decide to purchase, both are very safe and easy investments for your portfolio. 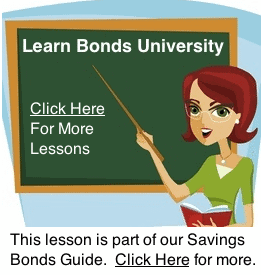 This lesson is part of our Free Guide to Buying Savings Bonds. Continue to the next lesson here. Want to learn how to generate more income from your portfolio so you can live better? Get our free guide to income investing here.